Steve Hansen believes New Zealand selected a "better team" for their third and final Bledisloe Cup Test against Australia. 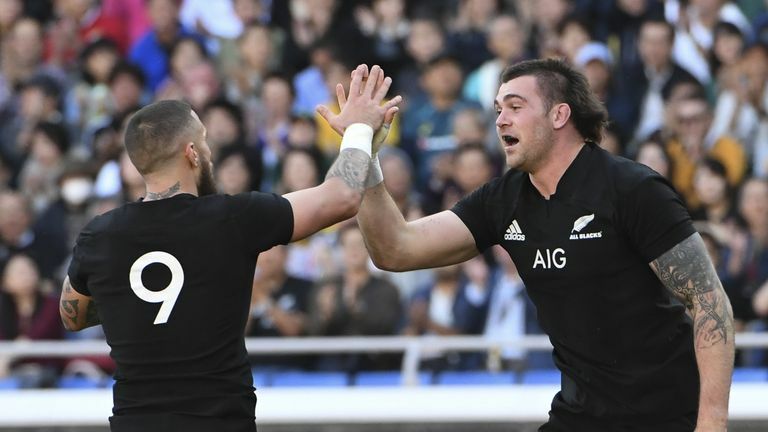 The All Blacks made sure of a clean sweep of Bledisloe Cup victories with a 37-20 win in Japan, with Beauden Barrett scoring 17 points in addition to tries from Liam Squire, Kieran Read, Ben Smith and Rieko Ioane. Australia pushed their opponents but a 66th-minute yellow card to Tolu Latu ultimately allowed Hansen's outfit to push away. Damian McKenzie returned to the All Blacks' starting XV at full-back, having been omitted from the 23-man squad for the win over South Africa in Pretoria, and Hansen felt that inclusion helped free Barrett. "I think that we selected a better team for a start with two play-makers," said Hansen. "It takes pressure off Beauden with someone at full-back that can play as a first-five so a good learning there. "I think that we cleared our minds a lot and pulled the trigger when we saw the picture rather than over-thinking." Amongst their five tries, New Zealand's third stood out as they clinically executed a set-piece move as they switched the direction of play at pace, with the speed of Barrett and Ioane doing the rest. "We had a good week really so a lot of the focus has been on doing, rather than over-thinking," noted Hansen. "As I said, we've been doing a lot of over-thinking since the Wellington game because we're a proud bunch and we didn't quite get that game right. "We've carried a bit of that baggage I think so, this week we've tried to get a little bit wider and a little bit clearer and come out and play. "When you play teams like Australia they allow you to do that too and we know now we are going to go up to the Northern Hemisphere and play sides that will want to shut us down so we'll have to deal with that." New Zealand will now prepare a squad to face Japan in Tokyo before their European tour which features matches against England, Ireland and Italy. "We've got 23 guys that are going to go up on Thursday, we'll prepare for this Test importantly and we'll sort out who is going to go tomorrow. "We'll enjoy this moment, it's a good one. It's always nice to beat Australia."